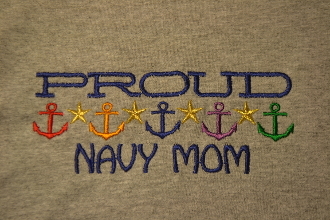 Show your pride for your Sailor with these wonderful embroidered shirts. Avaialble in several shirt and embroidery color choices. Design is embroidered in 6 colors as pictured or you can get all the embroidery done in one coloe of thread. The design is approximately 7in wide and 3in tall. Several choices to choose from for the whole family. The shirts are co-ed sized to fit men and women so keep that in mind when choosing your size.